The Banzai Racing Billet Aluminum Filler Neck is designed to be a direct replacement for the 86-88 FC RX-7 plastic filler neck. This part is used to eliminate the AST (Air Separation Tank) on the 93+ RX7 that have the two piece thermostat housing. The kit comes with a new Viton O-ring and stainless hardware. Uses OEM or aftermarket pressure cap. 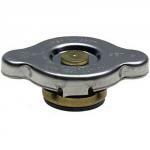 The GT Radiator Cap is a high performance replacement cap designed to provide 1.3 Kg/cm3 of pressure. This allows for higher cooling system pressures which raise the boiling point of the coolant, creating greater cooling efficiency. HKS Limited Edition Radiator Cap. Rated at 108 kPa or 1.1 kg/cm^2.